Wedding flowers » Why choose us? Tolly's Flowers wedding florists specialise in creating truly amazing wedding flowers for your church wedding or civil ceremony. Although based in Newmarket, Suffolk, we have worked with couples throughout the UK and even internationally, designing wedding flowers to enhance their chosen setting. Here are just some of the reasons why brides and grooms trust us with this important aspect of their special day. Our attention to detail is second to none and no stone is left unturned as we work closely with you to design the perfect floral decorations for your celebration. Our service starts with a face to face consultation where we will guide you through the choice of flowers, colours and designs for button holes, corsages, bouquets, pew end arrangements, decorative table displays and stunning pedestals for church venues or civil ceremonies. Whether you are planning an intimate family occasion or a grand reception involving hundreds of people, our full care and attention is guaranteed. We design and co-ordinate all of the flowers to give your wedding venue a look and feel that is totally personal and fully attuned with the rest of your wedding. Your wedding or civil partnership is the most important day of your life and everything needs to be perfect. To ensure complete satisfaction from all of our customers, we will only take on one wedding per day to enable us to focus exclusively on your big occasion. Our aim is create the biggest wow factor for your budget so you will remember your wedding flowers long after your celebration. Using our expertise we will come up with cost effective solutions that maximise the impact made for any given budget. We will save you money by making your flowers double up as much as possible – for example using church flowers or the floral arrangements from a civil ceremony as beautiful top table decorations. And even where budget is limited, we can still provide a dramatic display by utilising clever tricks such as creating half of your table centre-pieces as tall displays and half much lower. The overall effect is still gorgeous, but the cost is significantly less. Most couples are keen for their wedding to reflect their personalities, their tastes and their values. And for many modern couples this includes a desire to be eco-friendly in their choice of wedding arrangements, from choosing a wedding venue and honeymoon location, to selecting locally grown food, drink and wedding flowers. Our aim is to create our fabulous floral arrangements with the least impact to the environment. Firstly, we minimise transport by sourcing English grown flowers where possible. Please ask if you would like to use English only flowers. And of course, by using a local florist you will be minimising car journeys between the florist, yourself and the wedding venue. Secondly, we recycle all of our waste to minimise our carbon footprint. All unused flowers and greenery goes back into compost and we take care to recycle other materials such as cardboard and plastic. Finally, we take steps to make the best use of the flowers we use, by re-using decorations in different places. For instance, decorations used for pew ends or the wedding car back shelf display can be taken to the reception venue and used as table top decorations. 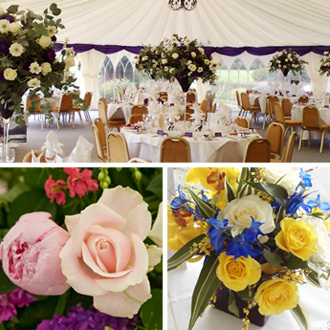 Wedding flowers – contact us now to discuss your wedding!